Here I'm going to explain how to use delphinusdnsd. A SOA RR should always be present. Notice the trailing . 's, in delphinusdnsd they can be omitted or placed, it doesn't matter. It matters however that every hostname must be expanded completely, it can't be relative to @ like in BIND. ; sample config file that is in production. As you can see the myzone.tld.signed file is "include"'ed. This is important for a structured config. We can include the myzone.tld.signed file right in the config file itself but there is obvious benefits to the way it is shown here. For example when using the dddctl sign tool that comes with delphinusdns one can only sign one zone, so it may as well be placed in a file called "myzone.tld". A new feature came in Delphinusdnsd 1.3.0, called "zinclude". This allows one to include only a zone config, ie. in another users path. The zinclude prevents other configurations to be accepted, thus making inclusion of zone files safer. 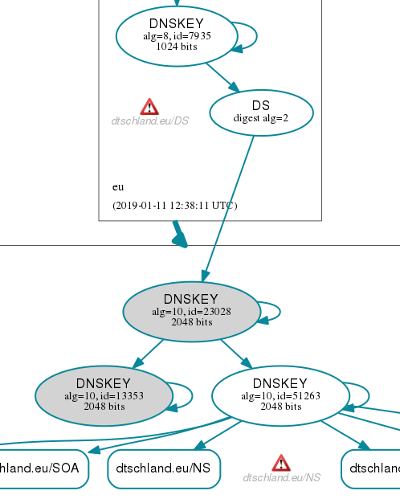 DNSSEC came to delphinusdnsd a few years ago. Our implementation is somewhat incomplete but we gotta do the best of it as we can. And as time becomes available more completeness will happen. To make delphinusdnsd zones be DNSSEC aware the option "dnssec;" must be placed in the delphinusdns config file. Also the zones will have to be "signed" with dddctl sign, in order to produce DNSKEY, RRSIG etc resource records. 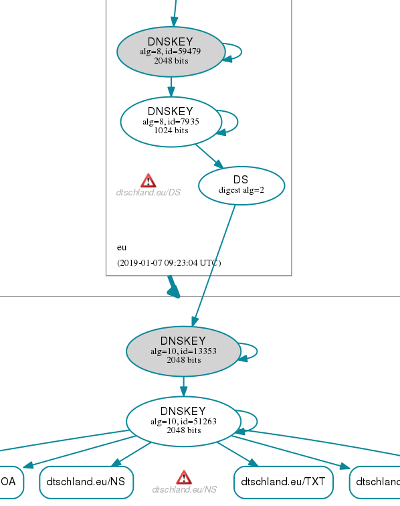 A delphinusdnsd with the dnssec option can also serve non-signed zones or a mix of both. The dddctl has a built-in help. Use it. -K              create a new KSK key. -Z              create a new ZSK key. Let's look at what we must do to create 2 keys (ZSK and KSK) and sign a zone. A KSK is a key-signing key, and a ZSK is a zone-signing key, for those that need help in the basics of DNSSEC. -rw-r--r--  1 pjp  pjp   164 Oct  1 11:18 dsset-myzone.tld. ; This is a key-signing key, keyid 50056, for myzone.tld. So we now know that the KEY pair that has the 50056 identifier is the KSK. This is important for the future when we re-sign the zone. The .key files can be shared with anyone in the public, the .private keys must be kept secret as they contain sensitive values. Sharing a .private key is like sharing the password to DNSSEC. We also have a myzone.tld.signed file, this is the DNSSEC zone file for the myzone.tld zone. A dsset-myzone.tld file exists as well. This one can be shared with the registrar or upstream zone (the one that delegates for you) as it's the DS record. Sometimes the registrar asks you for the .key file contents (DNSKEY) of the KSK, this is alright since the DS key can be derived from a DNSKEY record, and you're not revealing anything. (just keep the .private key to yourself). Once these are done, we can give it a spin. Copy the .signed zone file to /etc/delphinusdns/myzone.tld.signed and start/restart delphinusdnsd. -rw-r--r--  1 pjp  pjp   164 Oct  1 11:41 dsset-myzone.tld. As you can see by the ls flags that run, myzone.tld.signed and dsset-myzone.tld have changed. The dsset-myzone.tld file doesn't really change but it is re- created anew every run. Also what we didn't do is edit the SOA RR in myzone.tld to re-sign. This must be done, give it a higher sequence value. The sequence value is what we had originally called "2017083002", increasing this by one will work, or you could see that it is a date and change it to the appropriate date. At this point the "run" file does not have to be changed again in order to re-sign. In future versions of delphinusdnsd there may be key-rollover'ing which will change the syntax minutely. But we're not there yet unfortunately. Also note that with time the private key becomes weaker, since we can't introduce a new key we're stuck with this one until the code is written. This must be mentioned. Please review RFC 7583 before attempting any key rollovers. As you can see -S selects key 50093. We have successfully rolled the DNSSEC ZSK with the id 50093 to the new key with the id 51263. I'm basing the process on how to do this on RFC 6781 section 4.1.1.1 which has a Figure one which after reading this a little is straight forward. The warning here is a .eu warning that a certain nameserver did not reply. This is not in our control. Notice the warning, which was OK since it warned that EURid nameservers didn't reply at some IP. Your KSK is now rolled. Keep the 13353 key around in your zone for another TTL of DS. You have to wait for another day to do this next step. Your KSK is safely rolled. It should not have impacted services. Unfortunately delphinusdnsd is not complete. For those that wander to us and run it, and then realise they need a certain feature there is a way to go back. As of May 12th, 2018 there is two ways one can revert the zone file back to a BIND format. The recent "dddctl bindfile" method is the preferred way. Should this way have programming bugs and can't restore a BIND zone file there is the dig with AXFR method. With dddctl the syntax is "dddctl bindfile domainname zonefile" and the output is on stdout. This method has been used in regression to check for anomalies with other DNS software verification tools. In dig you can convert a delphinusdnsd config file to BIND format, just make an AXFR transfer and modify it by taking out the trailing SOA record. You now have a BIND config file. As a last word, we were built with our own goals in mind not others, hence you may find something that you don't like perhaps, and now you can revert.